Mills » Roger Perron Inc.
Natalie and I send along our thanks for a job well done on our kitchen / laundry room / breakfast area remodeling this summer. We appreciated the way you managed the work. Throughout the entire two months we felt the job was being handled efficiently: You delivered on your promises, and maintained a thoroughly professional, customer oriented relationship with us as well as with contractors working on the project. 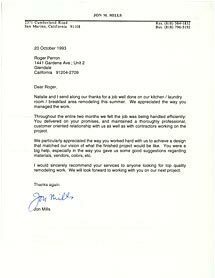 We particularly appreciated the way you worked hard with us to achieve a design that matched our vision of what the finished project would be like. You were a big help, especially in the way you gave us some good suggestions regarding materials, vendors, colors, etc. I would sincerely recommend your services to anyone looking for top quality remodeling work. We will look forward to working with you on our next project.